Bajrang Punia and Vinod Kumar Omprakash clinched bronze medals in 65 kg and 70 kg freestyle category respectively at the Asian Wrestling Championships in Kyrgyzstan on Saturday. 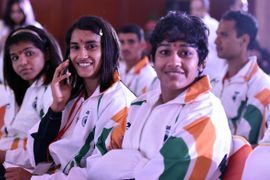 Their victories take India’s medals tally to eight with one gold, one silver and six bronze medals. Praveen Rana will replace double Olympic medalist Sushil Kumar at the upcoming Asian Championships in Bishkek, Kyrgyzstan, as the latter faces time on the sidelines due to a knee injury. Rana will participate in the Asian Championships which begins on February 27 and ends on March 4.